Sometimes, the road isn’t enough. Sometimes, the ride leads you to places beyond the reach of most vehicles. 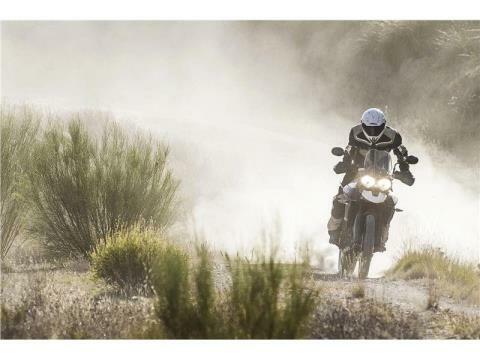 But cross country or cross-continent, you don’t need tarmac when you ride a Tiger 800 XC. With premium WP adjustable suspension and a torque-laden 95 PS 800 cc triple engine, there are few obstacles capable of standing in its way. 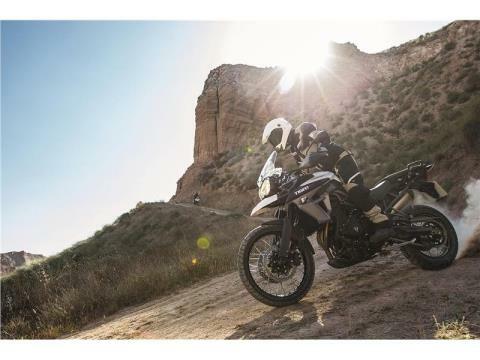 Triumph Traction Control and a responsive Ride-by-Wire throttle set a new standard in off-road adventure, while an improved riding position lets you make the most of the trademark Triumph handling. Add spoked wheels, 21 inches at the front, for improved off-road performance and a high-level front mudguard and you have everything you need for thrilling off-road riding. 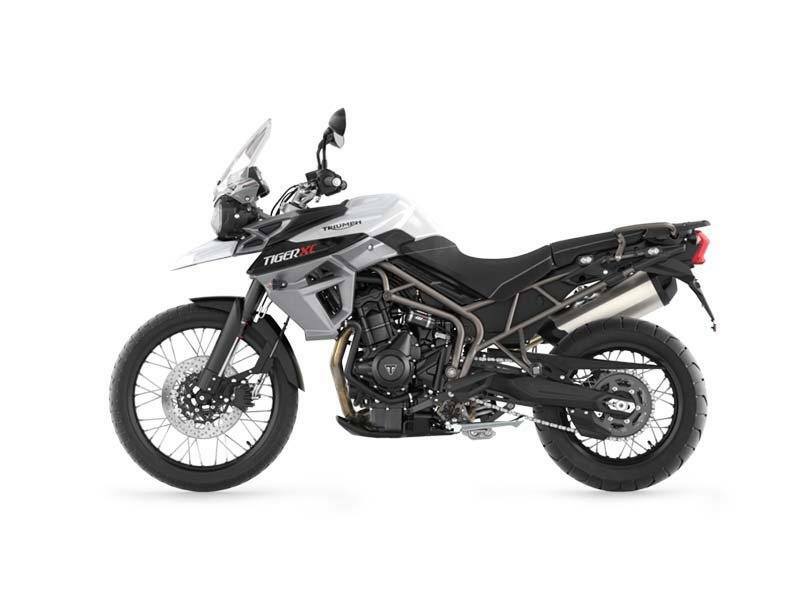 The suspension travel for the Tiger 800XC is a huge 220mm at the front, 215mm at the rear. Just what you need on poor condition trails. We fitted 45mm Showa upside down forks along with a preload and rebound adjustable Showa monoshock so you can adjust for either off or on-road riding. We needed to give you enough stopping force on the road without being too sharp or intimidating in the dirt. 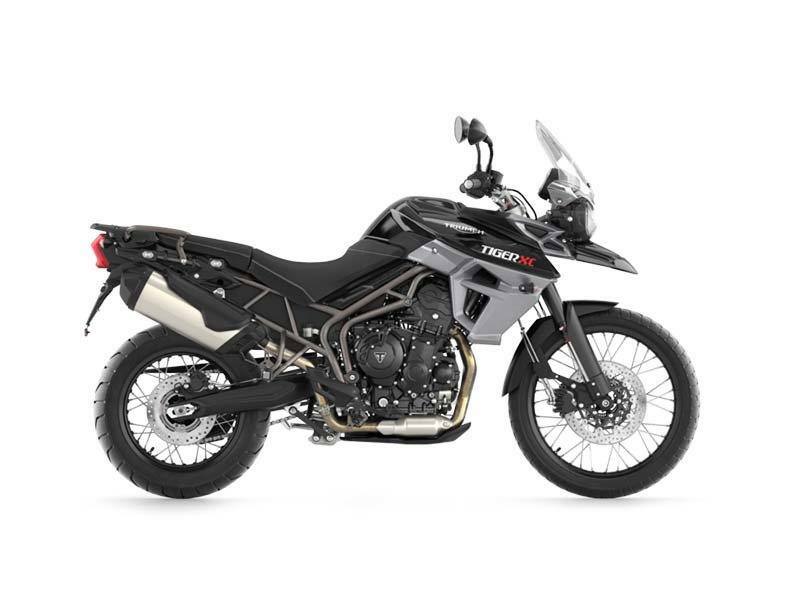 So at the front of the Tiger 800XC is a pair of two-piston sliding callipers and 308mm discs, with a single-piston calliper at the rear and a 255mm disc. ABS is standard but this can be switched off for off-road riding where you might want to be able to lock up a wheel. 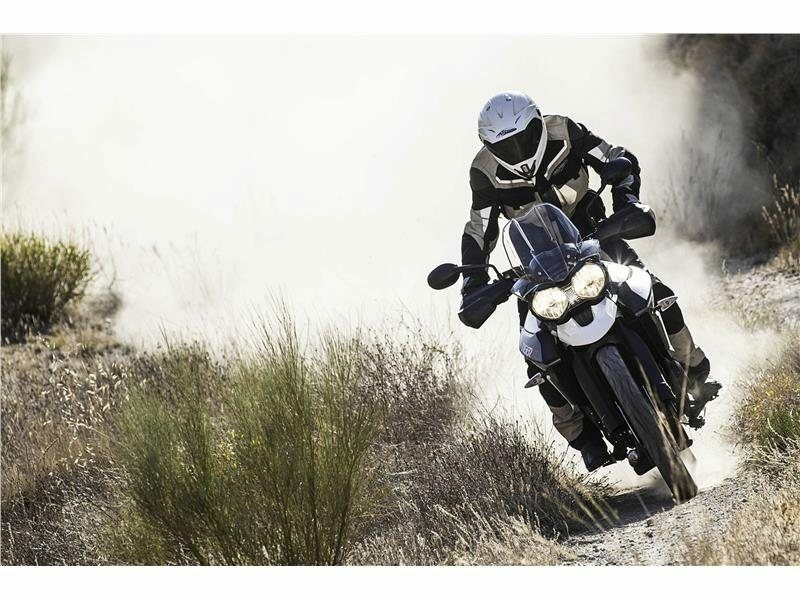 We added spoked wheels to the Tiger 800XC for better cushioning on rough terrain. The front is a big 21inch diameter to take dedicated off-road tyres and cope with holes and ridges. And the front mudguard is higher so that clogging mud won’t spoil your ride. We built the Tiger 800XC to have genuine off-road capability, so it’s tall with an upright and very spacious riding position. We made the bars wider than the standard Tiger 800s to give you extra manoeuvrability and the seat is lofty, although it's easily adjusted without the need for tools. Despite your high up stance the screen does a great job of fending off the wind pressure so you can stay at motorway speeds for as long as you need. We even gave your passenger plenty of room, chunky grab handles and well positioned footrests so long distances are no less comfortable on the back than they are for you. As you’d expect the Tiger 800XC uses the same tubular steel trellis frame as the Tiger 800 so you know it’s strong enough to take the knocks during serious off road use. The rear subframe is the same, designed to take our capacious panniers and big top box, plus a passenger, then go places where pure road bikes daren't venture. The three-cylinder 95PS engine, like the rest of the Tiger 800XC, is made for adventure. With so much torque spread right across the rev range you can pull hard from low revs. That's great for overtaking without the need to work the gearbox and touring effortlessly through mountainous terrain, but it's also exactly what you need to dig yourself out of tough off-road situations. But this is a Triumph so there's a lot more to it than clinical horsepower. We gave the Tiger an animated snarl that adds a whole new layer of character. An engine that communicates and encourages you to use it to the best of its, and your, ability. Just in case your Tiger 800XC attracts the wrong kind of attention, we’ve added a high technology security system. It detects a microchip in the key body and if it's not present the ignition system is disabled. This prevents a copy of the correct key being used to switch the bike on. With the Tiger 800XC you are fully equipped for all kinds of conditions, on-road and off. As standard you get the rear rack, along with the sturdy hand protectors and the coded key immobiliser for security. The dash shows you all the information you could need including average and instant fuel economy and range remaining, fuel gauge, service indicator, gear position and clock as well as speed and engine rpm. It's also preconfigured for the optional Tyre Pressure Monitoring System. We added the aerodynamically optimised screen to take the force out of the slipstream and make your ride comfortable at sustained high speed. You never know where you’ll end up on a Tiger 800XC so you need to prepare for any eventuality. And that can mean taking a lot of equipment with you. 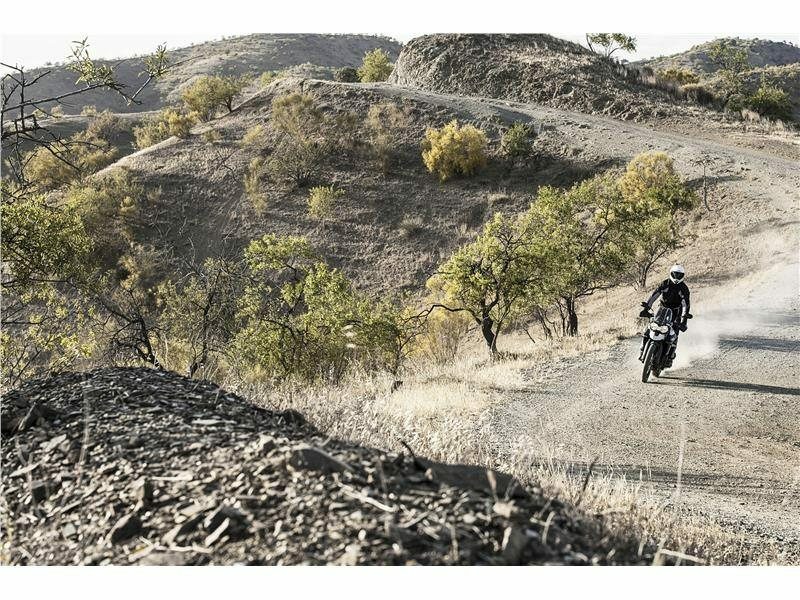 So luggage options include the capacious adventure-style panniers and top case, tank bags, tail packs and inner bags to suit every need. All developed in conjunction with the Tiger 800XC, so wherever you go you can take it all with you. There's even a clever lever behind the headlights for when the bike is loaded up, to dip them lower and compensate for the tail-down stance. No tools needed, just pull the lever and the lights are pointing along the road once again. Our confidence provides you with a two-year unlimited mileage warranty on your new Triumph and Genuine Accessories. Alongside the knowledge that we give you a 12 month unlimited mileage warranty on replacement parts. The Tiger 800 carries 6,000 mile (10,000km) service intervals.